Now and then it is still possible to find rarities! Recently my friend Igor Irikov in Riga (dealer and collector) showed me two real interesting things with rare "Special postmarks". 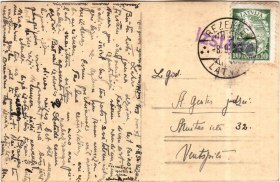 The first is a postcard sent from Rēzekne to Ventspils, cancelled with the standard postmark REZEKNE -8.9.36. G and an additional single-row cachet: Izstāde. This cachet was used in Rēzekne during the Latgale fair 06. – 14.09.1936 and is catalogued in the Harry von Hofmann Handbook about Latvian postmarks as Special postmark "S-05" (page 220). 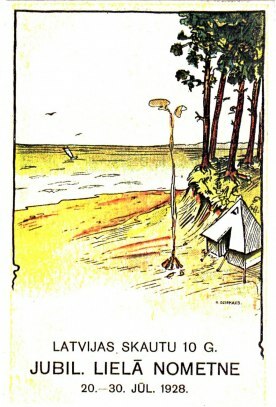 The postcard is dated at the same date as postmarked. In the text is to read that the weather these days has been awful, rain every day. The writer had hoped for visits to Aglona and Buku manor house but this was not possible due to the weather circumstances. The writer has visited the fair twice but hasn't seen everything as there are obstacles all the time. "In one stand only three things were exhibited and even there I was delayed." So, there is a need for more visits. The second postcard is even more unusual! 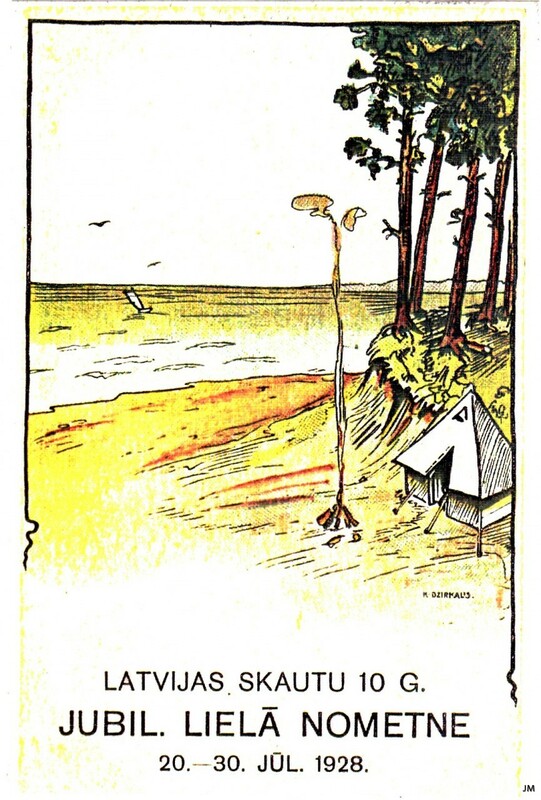 It is a special designed (by K. Dzirkailis) postcard issued to the Latvian Scout Jamboree held from July 20 through July 30, 1928 at Buļļi (Buļļu island), Jūrmala by the Rīga bay, commemorating the 10th anniversary of the Latvian Scout Central Organization. 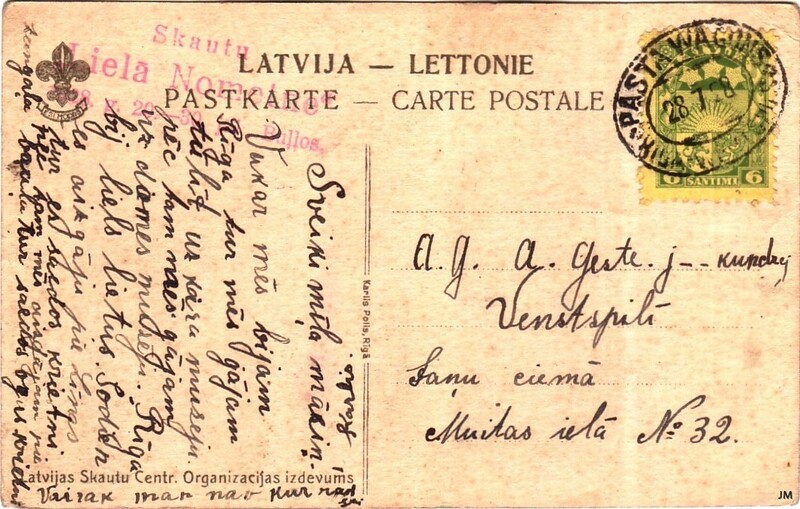 The postcard, addressed to Ventspils, is forwarded by a mail van and postmarked with the TPO marking PASTA WAGONS / RIGA – WENTSPILS, 28 7 28. Probably it is posted at the nearest railway station which was Babīte on the route Rīga-Ķemeri-Tukums-Ventspils. 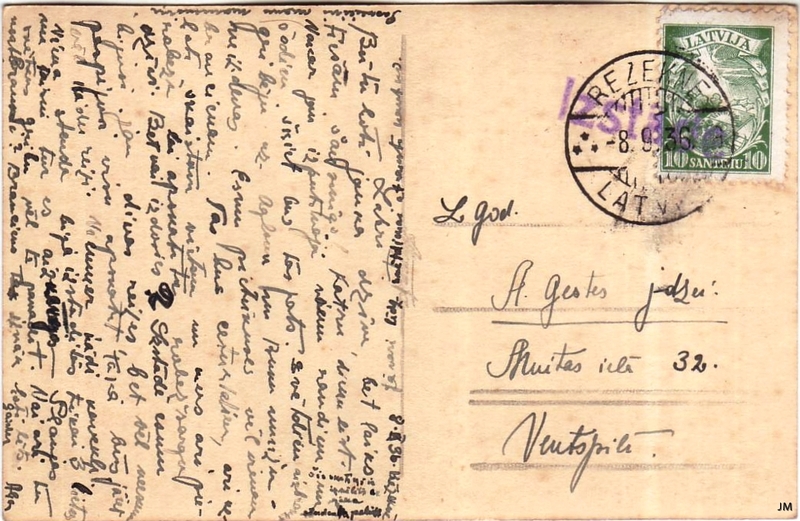 The most interesting thing with this postcard is the red cachet: Skautu „Lielā Nometne" 1928. g. 20. – 30. jūl. Buļļos. I myself haven't seen this cachet before. It is not in the Handbook and also not mentioned by Nikolajs Jakimovs in his "manuscripts". The postcard itself is shown on the front of the philatelic magazine "Latvian Collector" #35 (October 1982 – April 1983). It is from the collection of I. Rozentals but nothing is mentioned about the back side of the card, if it has been mailed or not. I assume it is a mint postcard. This actual postcard is sent from "Kārlis" to his sister. He writes that he has been visiting the "War Museum" in Riga and also paid visit to some friends where he got a lot of food and fruits. At the Buļļu Jamboree there were 218 tents raised. The camp-fire opening was held on July 21 with different performances by Hungarian, German and Estonian scouts. On July 22 the Jamboree was visited by the state president G. Zemgals who declared the Jamboree opened by hosting the Latvian flag. The program for the Jamboree consisted of different contests as swimming, signalization, first aid, hurdle race and others. On July 24 the domestic and international friendship day was held. My real thanks to Igor showing those two rare postcards!